Specially developed for use in timber-frame and modular building construction, Breather-Foil FR can greatly increase the U-value of the timber-frame wall. Whether pre-fabricated or assembled on site, Breather-Foil FR can afford the designer and contractor maximum flexibility when detailing timber-frame walls, without the expense of thicker timber frames or higher priced materials. 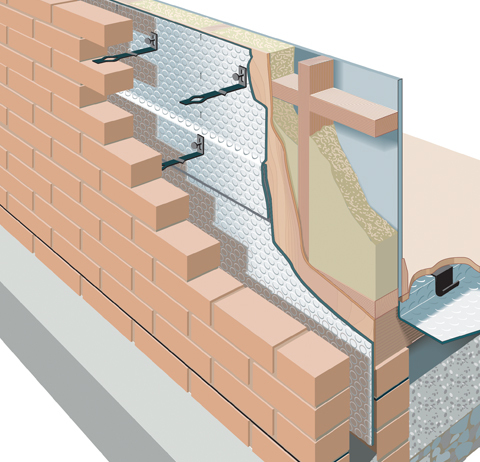 The Breather-Foil FR timber-framed wall system creates a wind-tight, draught-free, weather-sealed, yet vapour-permeable enclosure, when used in conjunction with external cladding, such as tile-hanging, masonry or weather-boarding. Breather-Foil FR is available with or without a removable coloured membrane (which can carry your company logo! ).